WPZOOM is a premium WordPress theme provider that was founded in Moldova in 2008, which makes them one of the oldest in the industry. Today they are servicing more than 40.000 customers and companies around the world and the number is growing. But with their small team scattered over the world, we must ask the question: are they perhaps spreading themselves too thin? There are a couple of free themes that you can download and directly go to work. However, if you want to see and have more, you will first have to purchase a theme or the club membership. After you provide some basic personal, contact and payment information, you will be taken to the member’s area. There you can download whatever you purchased. 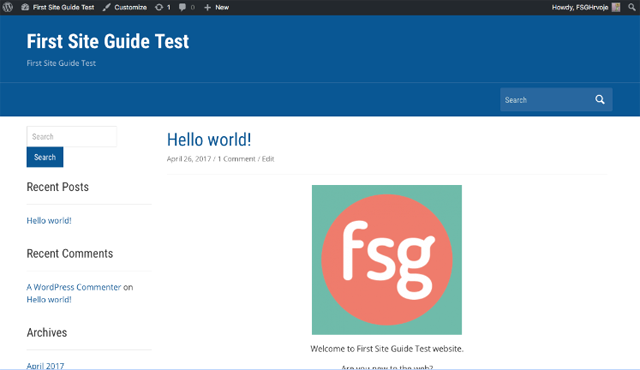 However, if you decide to first test out the water with one of their free themes, without creating an account, you will be redirected to WordPress.org for the download. Not your usual way to go, with one extra click, but nothing that would bother us. We decided to test out their free Academica theme. So after the download and upload in the .zip format on our WP website, we were ready to go. 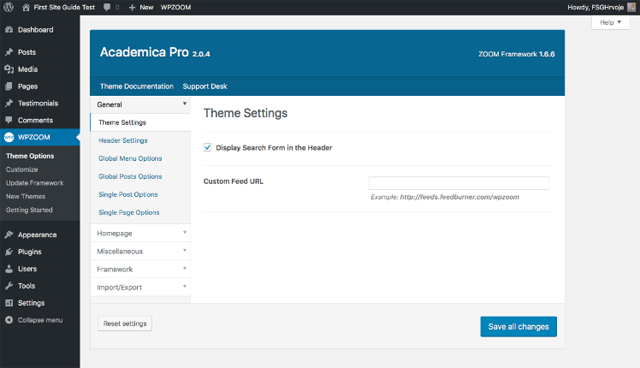 The first thing that we must say is that themes come with WPZOOM framework. While it is not a drag and drop builder, it will allow you to customize your layout quite a bit. It has a slight learning curve, but it is easy to grasp. It falls in the golden middle that will allow you to do not everything that you can think of, but it will allow you to do it with ease and it is very user-friendly. There are some neat widgets too, so you will really be able to make your theme distinct. What we noticed is that their themes are oriented towards content heavy websites. Academica and its paid versions are perfect examples for that, but then again, they are designed for academic purposes where you need a lot of information. While it looks like the newer themes are getting in a more minimalistic design approach, like for example Balance or Diamond, it is not necessarily a good thing to have (just) clean themes. Variety is good because providers can get more customers and customers can have more choices. However, if we consider the number of themes and the pricing for the membership, they fall on the more expensive part of the spectrum. While the price for one theme falls somewhat in the middle, the ratio of themes and even the cheaper membership is for those that can afford it in the long run. While the weed out themes, it can also be a bad thing if you really like it. Support is there, but it brings out the question of why creating a theme that will disappear within a decade. Even with that on our mind, their business and coding are great. They are very customer oriented and if we must put one thing in the spotlight, it might be their social media plugin. It supports over 80 social networks, which is insane, considering that you usually have to install one for each, or you get one that covers just the most popular ones. So if you have in mind that the themes are about quality over quantity, SEO ready, responsive, with the wide selection of shortcodes available, we really can’t say anything that doesn’t sound like a praise. 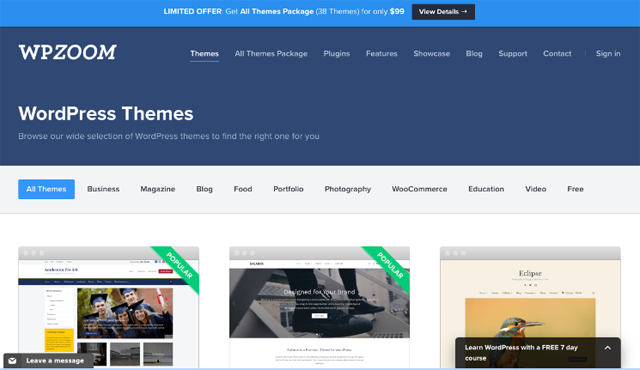 Currently, there are 38 premium themes to choose from, although they developed over 100 themes over the years. That points to catering and taking care of the old and not so modern looking themes. Aesthetics change so it is good to know that you won’t get outdated themes. That also means that all of them are responsive, which in today’s world, should almost be a given because a lot of customers are ditching usual cable internet for the mobile one. And yes, they also have e-commerce ready themes that work with WooCommerce. As far as the design of themes goes, their variety is big and with little nods and special things that are aimed at your niche. From food to business over to photography or e-commerce, you will get it all. From fonts to colors, to animations and demo content, we could not find any faults. Sure, there are some more conservative themes, but even they are not old looking. All in all, if this was a pageant for style and functionality, with so much variety, WPZOOM would get in top 5 in any category. When it comes to support, you will have all of your basic needs covered in a professional manner. There is WP 101, video tutorials, searchable knowledge base, FAQ, themes documentation, and ticketing system. We really had no complaints, except the standard “no real time” support that is common among WP theme providers. Other than that, despite their relatively small number of staff, their response time is something even bigger companies would envy. While with theme providers we usually get an answer in an about a day, WPZOOM never took over 12 hours. There are two paid plans and with its 14 days money back guarantees, customers have a shorter time to eventually change their mind than the industry standard of 30 days. Also bare in mind that a no-questions asked refund policy is applicable only on individual theme purchases, while for All Themes Package refund is provided only with a good reason. 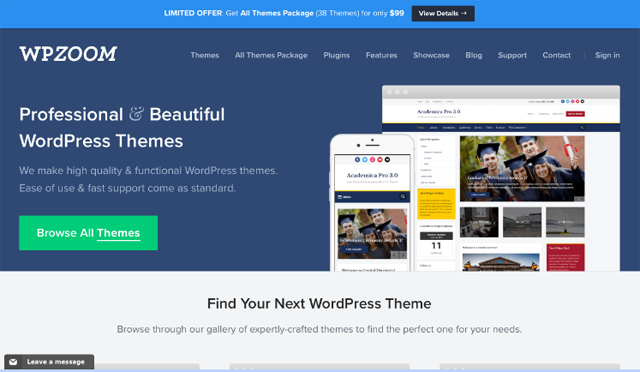 You can buy one theme for $69. Exceptions are Vime that costs $59 and Academica and Meets that are free. 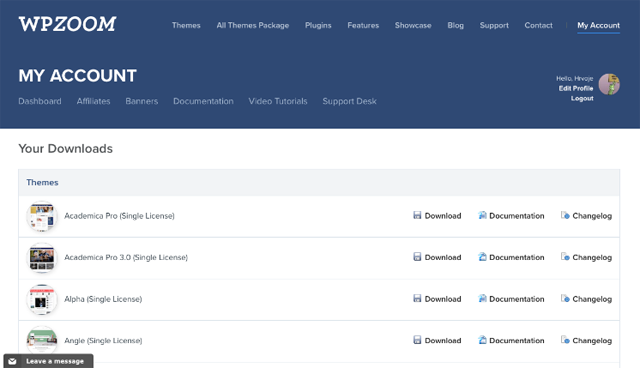 Package with all themes comes in two variants. All Themes Package will cost you $99. It will get you access to all current and future themes, 1 year of support and updates and unlimited domain usage. All Themes Package PRO will cost you $149. It will get you all from All Themes Package and additional access to PSD Photoshop files. 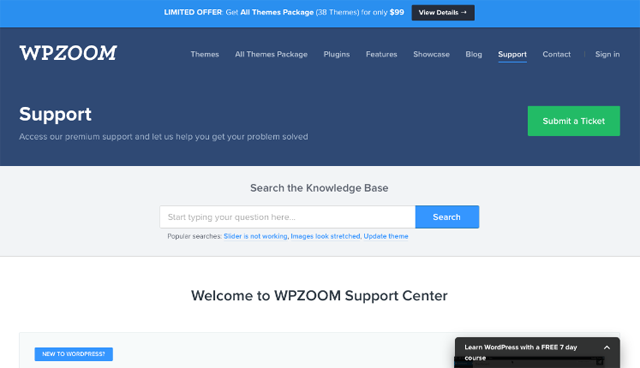 WPZOOM is a bit more pricey than your average WP theme club, at least if you factor in club membership. While there are clubs that offer the same price, many of them will have more themes. However, if you can afford it, we think that you will be quite satisfied, especially if you are a developer. They have an array of some most diverse themes we found out there and they are all solidly built upon their framework. While their themes are for content heavy websites, they do not look cluttered or old. With one of the fastest responses support staff responses out there, we were nitpicking when it came to negative things, which were almost nonexistent. So if you want to test them out, we encourage, just bare in mind that they have only 14 days money back guarantee.